Whether your cooking is at the level of 'can't boil an egg' or you are already a proficient cook, a course at Cookery School offers something for everyone. Enrolling on a course is a great way to spend a vacation, a weekend break or even just an afternoon. Above all, cookery schools are great fun and a place to meet like minded people. Across Britain there is a wealth of schools ranging form short courses to intensive for the budding professional. Here's my choice from best UK cookery schools, and one from Ireland, though I do intend to add more. The newest kid on the block (2014) is the unique Cooks, The Carlton School of Food in Yorkshire, Cooks. The Carlton School of Food is more than just a cookery school, it is designed to be a place to discover food in all its aspects. so, at the school, you will be able to learn how to grow, cook, photograph or write about food.There are baking, butchery, foraging and preserving courses. You can get back to basics or further hone your skills. With the unique, historical setting of Carlton Towers, you can explore the kitchen wisdom of the past or the daring foods of the future. The setting in 250 acres of parkland is glorious. The school is in the original kitchens of Carlton Towers, the ancestral home belonging to the Duke of Norfolk’s family and home to the Duke's brother and sister-in-law, Lord and Lady Gerald Fitzalan Howard. I do declare having had a hand in the development of the school, and I will be teaching a few of the courses in the beginning but from then on, I anticipate taking more of a back seat role. If you want to learn to cook, then always look to the expert. At Rob Green's Cookery School you will find exactly that; Rob is a talented and highly experienced chef and though he specialises in fish and seafood, his courses are also great for those who love to cook meat and other foods. Classes are small and intimate in his professional kitchen, in the heart of the beautiful fishing town of Whitby in North Yorkshire. Accommodation is also available in Rob's charming cottages nearby. Celia is a renowned food writer here in the UK and she knows the London food scene better than anyone. Throughout the year she runs exclusive tours of some of London's most vibrant foodie destinations. The tours run from approximately 10am to 2pm, and are specially designed each day to be bursting at the seams with exclusive food and wine tastings and encounters with passionate foodies and producers. Crayke Kitchen is based in the food lover’s paradise of Crayke, just twelve miles north of York. The cookery school takes place in Gilli’s charming cottage boasting an enviable kitchen with magnificent views of the countryside. Crayke Kitchen is a wonderful place to hone your cookery skills –and the good news is that it doesn’t cost a fortune, a one day class costs just £30 and a delicious three course lunch with wine is included. 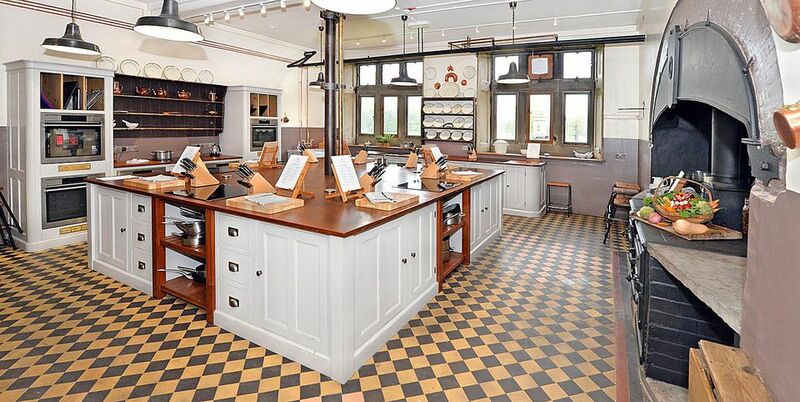 Hailed as one of Britain’s most famous schools, this is one for the serious cook. The school is in the magnificent grounds of celebrity chef Raymond Blanc’s 13th-century manor house hotel and restaurant. I attended the school a few years ago, and made a revisit in 2012 and can vouch for the standard and quality of both the teaching and the facilities. It doesn’t come cheap though. It’s the only cookery school in the world to offer the chance to learn in the kitchens of a two-Michelin-starred restaurant. Owned and run by French chef and baker, Richard Bertinet, The Bertinet Kitchen offers a range of relaxed and fun courses for food lovers of all abilities. There are demonstrations or hands on classes where you can learn to make simple and delicious creations. The famous fish and seafood cookery school founded by celebrity chef Rick Stein in 2000. To avoid disappointment please note, Rick Stein does not teach at the school, though his influence is evident. One of the most glorious settings to learn to cook is at Swinton Park Castle in North Yorkshire. Swinton is a 30-bedroomed luxury castle hotel with the cookery school housed in the ground floor of the converted Georgian stables, which overlook the castle turret and parkland. Classes are run by the head chef with celebrity chef Rosemary Shrager making an appearance throughout the year. This is a school to not only learn to cook, but to spoil yourself in the lap of luxury. Sleek, modern, facilities and small classes ensure you get the most for your money from chef Martin Wishart. The Michelin-starred chef set up the school with cooking enthusiasts in mind to learn a blend of contemporary and classical techniques using seasonal ingredients. He offers a range of classes including for children. Updated: Angela is now firmly back at Llanrech Vineyard in Wales. A great school which I can vouch for as I was there recently. Angela Gray, formally of Llanerch Vineyard has now gone solo with a new venture, based at three fantastic locations across wales. The classes are held in south wales in the imposing Finmon Castle, in remote West Wales (but easily accessible via M4) at Slebech Park , a shooting estate, and in North Wales as Ffin-y-Parc. Ireland's foremost celebrity chef Darina Allen and her husband Tim run the school with enthusiasm and skill. The residential cottages are on the Allens' organic farm.